(AP) BEIRUT - Emboldened Syrian rebels launched a major operation in the north, targeting security compounds and bases around the country's largest city of Aleppo, activists said Friday. The coordinated strikes come two days after President Bashar Assad conceded his forces have been unable to quell the more than 17-month-old rebellion against him. 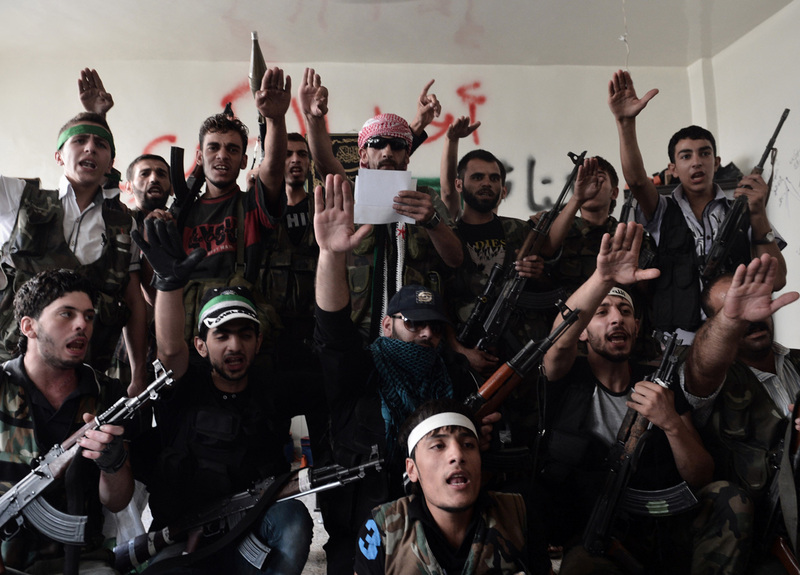 Weeks of intense bombardments by the Syrian military, including airstrikes, have failed to dislodge the rebels. Instead, Assad's opponents have become more brazen as fighting rages and the civil war shows no sign of ending soon. The rebel offensives in Aleppo, which began shortly before midnight Thursday and continued through Friday, were being led by a brigade mainly consisting of army defectors who specialize in operating artillery and tanks, said Mohammed Saeed, an activist based in the city. The new operation, called "The Northern Volcano," will focus on coordinated attacks on specific military and intelligence targets in the city and surrounding province of the same name, Saeed said via Skype. Saeed said the first attacks began shortly before midnight Thursday and lasted until Friday, when the "Brigade of Free Syrians" launched coordinated strikes on several security compounds in Aleppo. Bashar Assad: Fight against Syria rebels "better"
The Britain-based Syrian Observatory for Human Rights said rebels killed and wounded a number of regime forces at one compound in the Aleppo neighborhood of Zahraa, but it gave no figures. Saeed said rebels attacked four security buildings around Aleppo with tanks, rockets and machine guns. The state-run news agency, SANA, said troops killed and wounded several gunmen in the clashes. Rebels seized several areas in Aleppo, Syria's commercial capital, last month, marking a turning point in the conflict because the region had long been staying out of the conflict. Rebels also control much of the wider Aleppo province, including areas on the border with Turkey. Government forces have been fighting to recapture the territory, but the two sides have found themselves stalemated. Fighting also continued elsewhere in Syria, including the capital, Damascus, showing that the rebels have a presence in main population centers, not just the outlying districts where the uprising began. The Observatory and the Local Coordination Committees, another activist group, reported clashes and shelling between troops and rebels in the southern province of Daraa, around Damascus and in the central region of Homs. Heavy clashes raged for a third day inside the sprawling Abu Zuhour air base in the northwestern province of Idlib, the Observatory said, adding that anti-government gunmen were storming officers' housing units. Activists estimate more than 20,000 people have been killed in the uprising Assad's regime, which began in March 2011 with peaceful protests but rapidly evolved into a civil war. The U.N. refugee agency reported a growing number of Syrians fleeing to Lebanon's eastern Bekaa Valley, near the Syrian border. Local authorities report that about 2,200 people arrived there over the past week, almost double the weekly average, agency spokesman Adrian Edwards said. He told reporters Friday in Geneva that another 400 Syrians are reaching northern Lebanon each week. Edwards said Turkey has opened two more refugee camps for Syrians in the past week and is now hosting 80,410 people in 11 camps and schools in its border provinces. In France, Foreign Minister Laurent Fabius warned that France would use military force if President Bashar Assad ever uses his chemical weapons. "Our response would be immediate and sharp as lightning," Fabius said Friday on Europe-1 radio. He suggested that France would not wait for U.N. permission for such a response. "Bacteriological and chemical weapons are of a different nature from ordinary arms," he said. "We cannot tolerate that these weapons, whose fallout could spread, would be used." Syria said in late July that it could use chemical or biological weapons if it were attacked from outside.